We are a community of Beauty, Hair & Retail professionals. We bring you together through a network driven by the latest industry jobs, news and event sharing. Business owners, showcase your jobs to our professionals today. Jobseekers start your new career here! Become an Exclusive Member for free here. Working exclusively within the beauty and wellness sectors since 2008, BeautifulJobs is used by the top names in the business and has successfully placed professionals within roles in Therapy, Management, Sales & Training, Retail, Cosmetics & Events as well as Front of House, Administration and Marketing. For jobseekers, We offer free job match consultations and can give bespoke career advice. Our CV Service will showcase your skills, qualities and achievements. We advertise hundreds of Beauty and Hair jobs across Ireland and abroad. For business owners, as well as specialising in online recruitment, we provide Executive Search and Brand Advertising services. Full payment upfront, jobs to be used within a 12 month period. Signup now to advertise your job or email info@beautifuljobs.ie and we can do it for you. For more information about our packages, see our online recruitment page. Take the difficulties away from creating and maintaining your CV with our Free CV builder. The builder will help you create your own professionally designed CV, step by step. 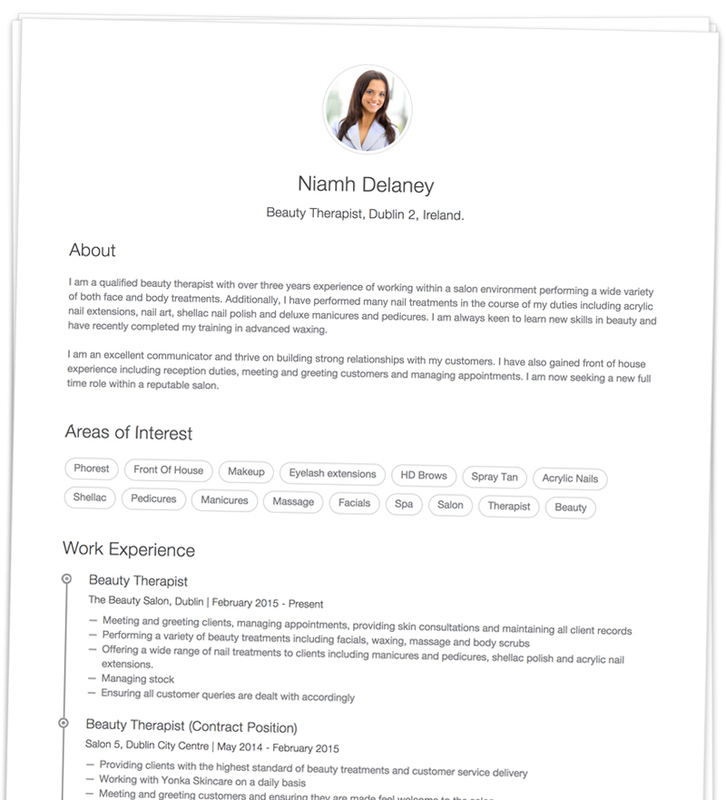 You'll get an interactive online CV with photo galleries to showcase your work that can also be printed and used as a traditional CV. 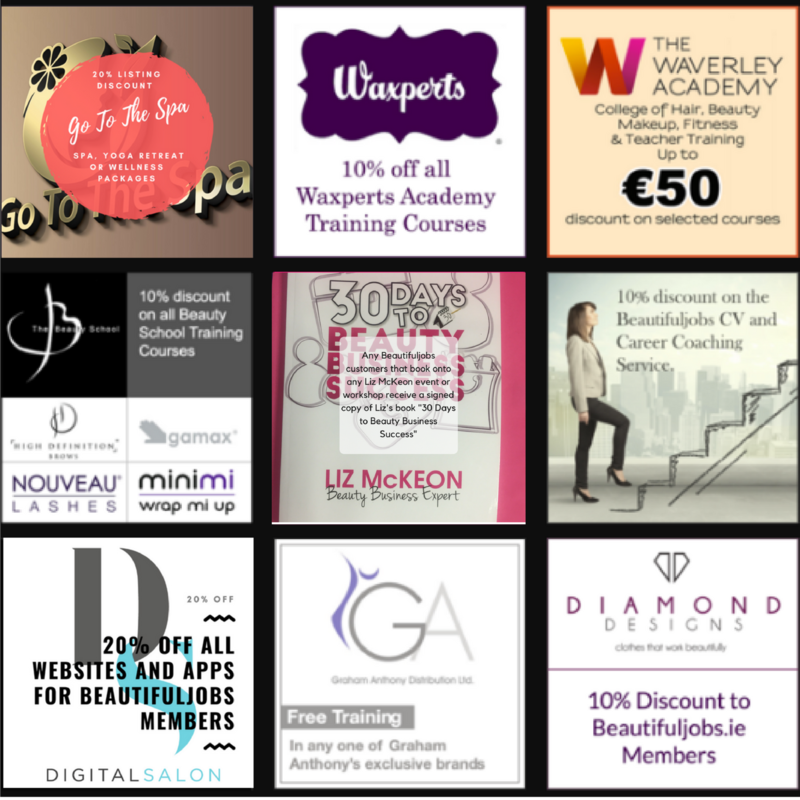 Beautifuljobs Members can avail of special offers and discounts across a wide range of affiliated organisations. Membership is free and enables you to apply for and post jobs on our website. Sign Up Now to avail of our these offers. "I just wanted to touch base to say we have made a hire for the Dublin role through BeautifulJobs WOOHOO! She is GREAT and exactly what we we're looking for. THANK YOU! You have both been super helpful so far and just wanted to say how grateful I am. Many of the candidates I have spoken with for this role who have applied through you, have said great things so it’s good to know we are working with a company like yours with a great reputation." Gemma Taylor, International Institute for Anti-Ageing IIAA. We've always found BeautifulJobs to be extremely useful, especially when needing to fill positions urgently. Aoife Jennings, Ireland & Scotland Recruitment Manager, Steiner. We achieved more success with BeautifulJobs in just two weeks than the time we spent with other professional recruitment services and it cost us less. We would highly recommend BeautifulJobs to anyone looking at using recruitment services within the beauty industry. Thank you so much. Geraldine Greenan, Proprietor, Geraldine's Skincare Clinic, Westport. We have no hesitation recommending BeautifulJobs to anyone seeking beauty professionals. The website is superb and gives a unique service making every effort to understand our role and the best candidate to fill that role. Anita Murray, Managing Director, Pink. "I am very pleased with the services BeautifulJobs have been providing to us over the past few months. Maria takes onboard all of our requirements and always presents us with the right candidates. We have saved a lot time and effort on recruitment and this has proven to be a very cost effective way to recruit new staff. I would highly recommend BeautifulJobs"
Grace Rubinger, Managing Director, Skinfull Affairs Ireland. Receive, collate and rate all of your job applications in a single place. Managing job applications through e-mail is hard; e-mails are difficult to organise, can be discarded as spam and don’t allow you to see at a glance the quality of your applicants. 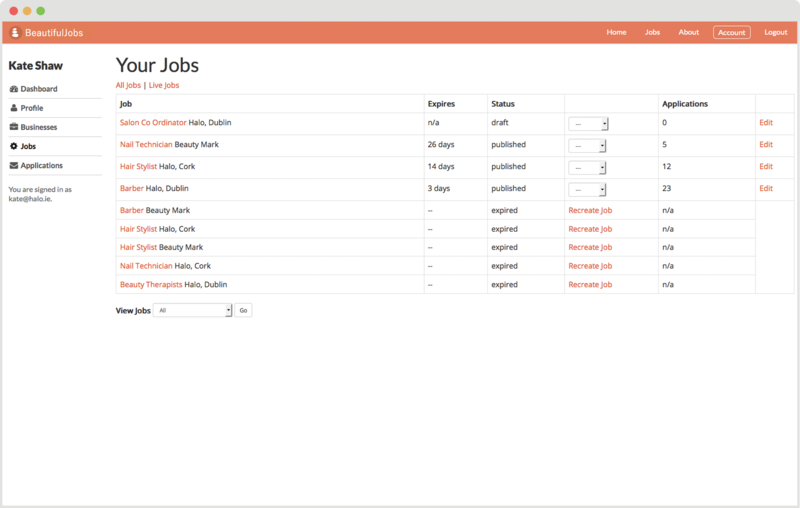 BeautifulJobs enables you to keep all of your job applications together in a single, easy-to-mange dashboard. Share jobs, earn referrals, get rewards.  Our referral system allows you to share jobs with your friends and earn rewards for successful placements. When someone applies for a job after following your referral url, you'll be credited with points that can be exchanged for vouchers from selected partner suppliers. 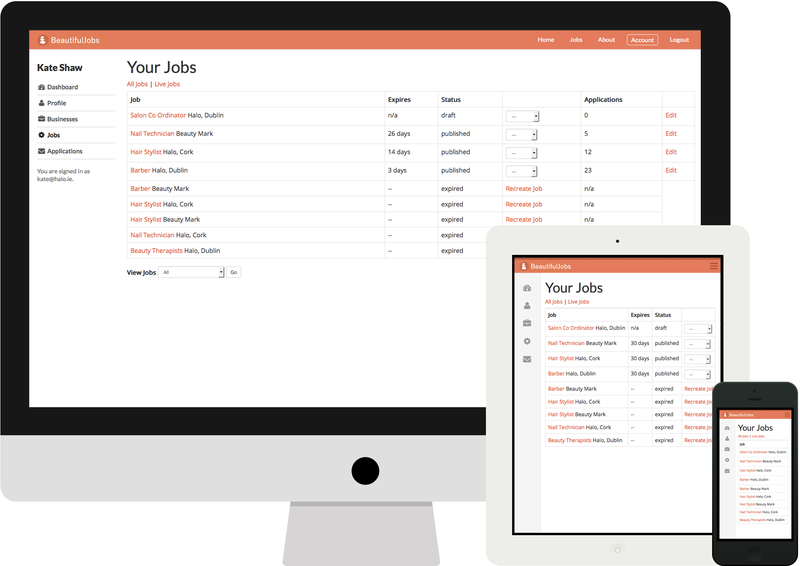 Track your jobs and job applications across all of your devices. Our website is responsively designed so that you can access your information on mobiles, tablets and desktop. You've successfully subscribed as an event and magazine viewer.